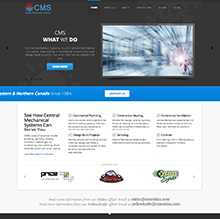 Clean design with clear top level messaging and clear calls to action. 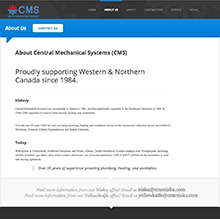 Central Mechanical Systems was incorporated in Alberta in 1984, and then additionally registered in the Northwest Territories in 1988. 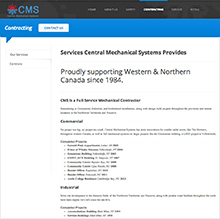 In 1998, CMS registered in Nunavut when the new territory was established. 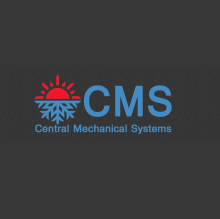 Over the past 30 years CMS has been providing plumbing, heating, and ventilation services to the construction industries across the Northwest Territories, Nunavut, Alberta, Saskatchewan, and British Columbia. Custom logo, branding, digital marketing, remarketing and website design. Logo design and corporate branding. Clean layout with clear top level messaging. Digital marketing ensures inbound leads and prospects. 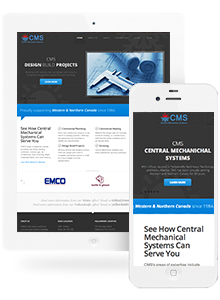 Simple to navigate gives users the ability to see all services and contact easily.